Product prices and availability are accurate as of 2019-04-14 06:56:41 UTC and are subject to change. Any price and availability information displayed on http://www.amazon.com/ at the time of purchase will apply to the purchase of this product. Vital Signs: Discover’s longest-running and most popular column. Each month, an emergency room doctor describes and solves a real-life medical mystery. Better Planet: Questioning the choices we make about our environment, and how we affect its overall health. 20 Things You Didn’t Know About...: An exploration of arcane and interesting bits of information that you may not be able to Google. Data: Informative news section with short pieces on breaking science developments. Blinded by Science: A column where humor meets science, written by novelist Bruno Maddox, nominated for the 2007 National Magazine Award, Columns and Commentary. ThinkTech: Discover's monthly look at technology moving out of the lab and into the mainstream. Features: Cover subjects represent a selection of topical science, technology, environmental, global and health issues that affect our life and the world around us. Recent issues include: Year in Science, Dedicated issue, The Secret Einstein, Better Planet, Extreme Engineering, Scientist of the Year. Discover draws on the talents of some of America's premier nonfiction writers, including Walter Isaacson, Jared Diamond, Jim Holt, and Carl Zimmer. Some of our contributors are veteran science journalists; others regard science just as one source of great ideas. What they all have in common is a rare ability to conduct deep investigations into the most complex topics and emerge with stories that will entertain and enlighten anyone who appreciates a good narrative. 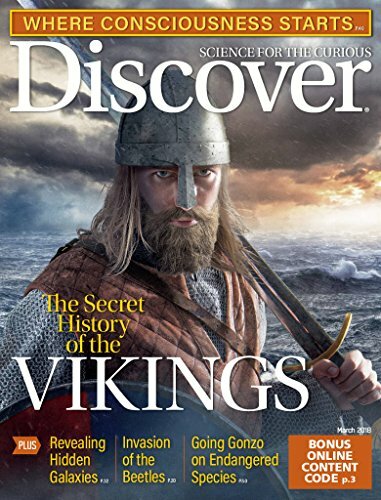 Discover gives its readers the real story: on-the-scene photography, highly personal portrait shots, and cutting edge scientific imagery. The design is elegant and refined--not dry like a textbook, not glossy and remote like a travel guide. Every issue contains a balance of big-idea, text driven stories and more image-rich features that convey the feel of where and how the most amazing research happens. US Navy, Chevy, Hartford, Bose, Aridian Publishing, Shell, BBC, PBS, VISA, Ford, Ambien, GM, Sony, Sanyo, Discovery Channel, Math Tutor, Rosetta Stone, Gel Pro, Caravan Tours, First Street, Vanguard, Michelin, Lantus, etc. Discover was presented with an award by the American Society of Journalists and Authors for July '07 feature on Science and Islam. MPA Digital Awards 2007 BEST PODCAST SERIES: Recognizes creativity and content innovation in a magazine’s podcast series – Discover’s Vital Signs won 3rd place.